Visible light is a kind of electromagnetic wave. It would not be a particularly exciting kind, hadn't it been the one for which our eyes are tuned. The human eye is like the antenna of a radio receiver except that it is sensitive to a different frequency band. We can see light in having a wavelength from around 380nm to roughly 700nm. 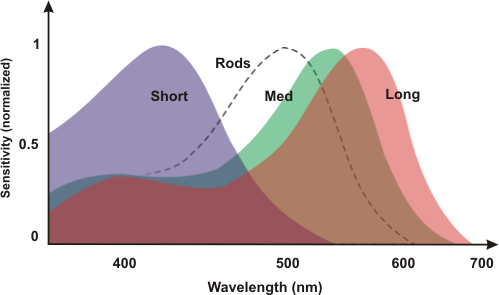 This band of wavelengths is called the visible spectrum and is flanked by ultraviolet radiation (the favorite of beach- goers worldwide) and infrared (which we ourselves generate in the form of body heat). In the first part of this article we'll be discussing color theory, faithful color representation being the subject of subsequent parts. A significant part of this section was inspired, both in content and in presentation, from the course on Television Systems of Prof. Burlacu that the author has attended several years ago at the ‘Politehnica' University in Bucharest. Even before we begin any debate on color theory, a very important point needs to be reminded. Color theory is based on the properties of the human visual system (HVS), therefore, the scientific notions involved always relate to the way humans perceive color. While the earliest observations on light and color can be traced back more than 2000 years, the work of Thomas Young, J. C. Maxwell and H. von Helmholtz, who were among the 19th Century's authorities on light, established the principles of the mathematical theory of color. Maxwell is credited with the foundation of the trichromatic theory, which states that any color can be obtained by combining, in various proportions, three conveniently chosen primary colors. 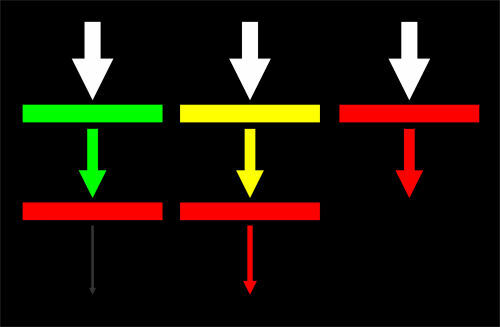 The choice of primary colors is what links the theory with the physiology of the HVS. The eye's light sensor, the retina, is composed of two types of light- sensitive cells. Rods, the cells of the first type are sensitive to light intensity and are what we use to perceive shapes and contours. The other kind of cells, cones are responsible for color vision. There are three subtypes of cones, the difference between them being the wavelength selectivity, or primary color for which they are tuned. 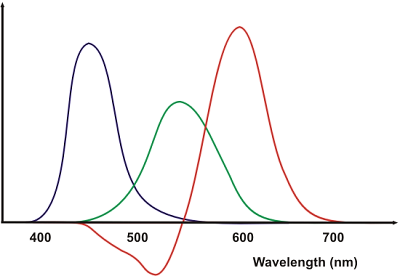 As shown in the diagram, the cones for short (S), medium (M) and long (L) wavelengths are most sensitive to blue (B), green (G) and red (R) respectively. As a side note, the sensitivity of the respective cones to red, green and blue is not equal. That is to say the quantity of light necessary in order to produce the same sensation of intensity is different for S, M and L cones. Returning to the trichromatic theory, it is only natural to chose R, G and B as the primary colors, as these three best fit the receptors in our eyes and thus, when mixed, produce the whole range of visible colors. Having said that, any three colors can be used as primaries, but by not choosing them ‘conveniently', the range of colors that may be obtained by mixing is limited. When it comes to mixing colors in order to produce a new one, there are two approaches. Subtractive color mixing uses light filters to remove the unnecessary colors present in the incoming radiation. For most purposes white or quasi-white light is used, as it contains all the colors of the spectrum. This approach is objective, in the sense that by filtering, you get a certain color only if the incoming light contained that color. For example, by using green light and a red filter, you would not get red, as red is not part of the initial green light. Filters can be stacked, the result being that only the wavelengths that are common to all of the filters' transmission spectrums are let through. Two major types of light filters are used. Transmissive light filters (e.g. colored patches of glass or plastic) stop some of the wavelengths from the incident light, only letting trough a limited range of colors. Reflective light filters such as paints, dyes and pigments absorb the unwanted wavelengths, reflecting back only some of the colors. The second approach to color mixing is called additive and uses several light sources of different colors to create the sensation of another color. For instance, by combining red and green one gets yellow. 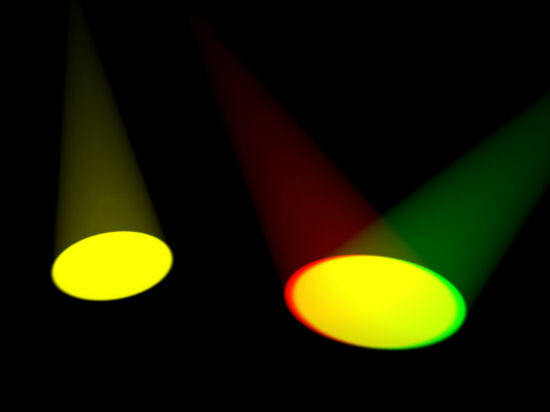 The yellow resulting from the combination of red and green light gives the same visual sensation as the yellow produced by spectrally pure yellow light. Additive mixing is said to be subjective, meaning that only the sensation is the same; the color obtained by mixing is not present within the combined spectrums of the incoming light. In practice, there are several ways of obtaining colors by additive mixing, all of them relying on specifics of the human visual system. Optical additive mixing combines two or more colors on the same surface at the same time. This is the technique used in older video projectors. 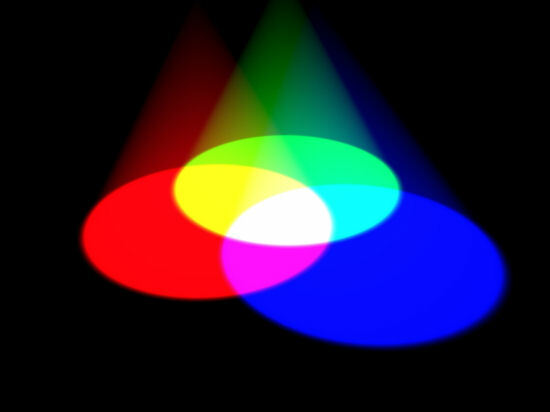 Spatial color mixing relies on the finite resolution of the human eye. From a distance, two dots of different color are perceived as one dot the color of which is the combination of the actual dot colors. Spatial mixing is the basis of color monitors that use color cathode ray tubes. The third way of mixing colors by adding them together is called temporal additive mixing. Two or more colors are combined on a surface, but at different moments in time. Given the fact that the human visual system can process information at a finite speed, combining primary colors at a higher rate gives the sensation that the primaries were displayed simultaneously. Therefore the subject has the visual sensation of colors that were not present among the primaries. Modern digital projectors use this approach. Using R, G and B as primaries, experiments were made regarding the subjective nature of additive color. Subjects were asked to spatially combine R, G and B light in different proportions in order to obtain the same visual sensation as from a separate, reference color, a process called color matching. By repeating the experiment with different reference colors chosen form the visible spectrum it was possible to come up with mathematical descriptions of all the colors of the spectrum based on the relative amounts of R, G and B needed to obtain the same visual sensation. The results, which are average for a group of observers, are graphically represented in the image below. One interesting result is that for some reference colors red is not added to the mix of primaries but to the reference color itself in order to obtain the same sensation by combining the two remaining primaries. This is shown by the negative values for the proportion of red. Another thing to note is that by selecting different values for the wavelengths of the primary colors yields different color matching curves. The color matching test produces a description of colors visible to humans in terms of the proportion of the R, G and B primaries necessary in order to obtain the same visual sensation. Over the years, several colorimetric systems, ways of classifying and identifying colors by specific attributes, have been developed. 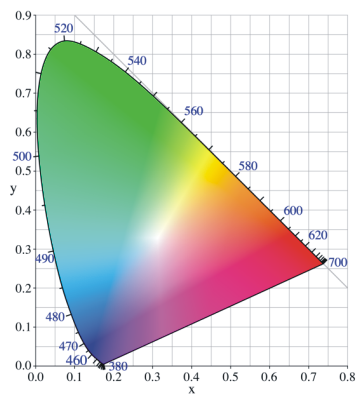 The chromaticity diagram developed in 1931 by the International Comission for the Illumination (CIE – Comission Internationale pour l'Eclairage) is still a widely used tool when it comes to color spaces. By using the values from the color matching diagram it is possible to plot into three-dimensional space the position of all the colors in the spectrum, having the amount of red (R), green (G) and blue (B) on the three axes respectively. The origin (O) is the black point where there is no red, no green and no blue. The 3D RGBO color space is normalized to rgbO, with r = R / (R+G+B) etc. The intersection is projected on the rgO plane using the assumption that since the space is normalized (r+g+b=1), b can always be derived from b=1-r-g. The resulting shape is called the Wright-Guild diagram or the horseshoe in more familiar terms. The horseshoe has one major drawback in the fact that there are regions of the diagram for which the coordinates in the rgO plane are negative. This matter is resolved by creating a new coordinate system within the rgO plane. The new coordinates x and y are not orthogonal when created, but the diagram is stretched so that in the end x is perpendicular to y. The y axis is chosen proportionally to perceived brightness in the Wright- Guild diagram. The point where x = y = 1/3 is called the reference white (E white). The coordinates x and y are artificial. They do not represent real colors in themselves. The CIE 1931 chromaticity diagram represents all visible colors at full luminance. 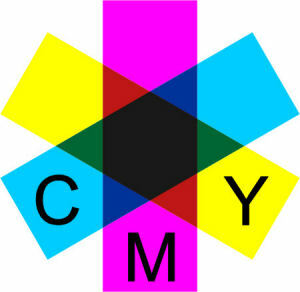 It is part of the CIE-XYZ color space. Think of the diagram as the top slice of the CIE-XYZ color space. Other slices have colors with the same hue and saturation, but darker. These other slices are stacked on the z axis.